The escalating demand for brightly colored food, given the perception of color as a prelude to nutrition & taste, has elevated food colorants market trends in the recent years. It would be surprising to note that an astonishing amount of the food eaten globally is processed and is altered from its natural state for increasing shelf life, removing harmful bacteria, and making them appealing to consumers. If estimates are to be believed, more than 70% of the diet of the average U.S. resident is from packaged and processed foods, much of which would not look appealing had they been not colored. In fact, it wouldn’t be wrong to say that these colorants are the cosmetics of food, that is set to amass a massive chunk of the global food additives industry in the years ahead. How the demand for natural colorants is shaping global food colorants market trends? When it comes to natural colors, the global food colorants market is already seen following the wave of green & clean ingredients as consumers have spoken loud and clear through their purchase patterns. In fact, reliable data indicates that globally over three in five consumers say that they do their every bit to avoid artificial colors as well as preservatives. Moreover, a GNT group research report claims that 66% of global consumers check contents and labels for edible items before buying any product. It is pretty clear that natural colors are in, a fact that is further validated from a recent instance when Chr. Hansen, one of the world’s leading company operating across the global food colorants market, announced that it has purchased a manufacturing plant, Banker Wire, with plans to turn it as the new North American headquarters for its natural food colors division. This instance significantly bears testimony to the fact that the food companies are under constant pressure from consumers to make to switch to natural ingredients, additives, and colorants. Further helping the F&B manufactures take the clean labels trends to the next level, Chr. Hansen was seen bending over backwards to push innovations in its natural ingredients division by expanding its coloring foodstuff range. As people are paying more heed to the ingredients list of the products than ever before, it is quite obvious that consumer demand for “clean-labels” continues to rise rapidly. The company claims that natural colorings are still considered additives albeit extracting from natural sources. In this regard, the company will be focusing on expanding its range of natural coloring foodstuff from saffron, turmeric, spirulina, paprika, beetroot, tomatoes, and other fruits, vegetables and plant concentrates – that are not chemically altered. Frutarom is another industry major, standing in the list of top five natural colors suppliers, that is securing its prominent positions by introducing its sustainable and fully traceable source of natural food colorants and pigments. 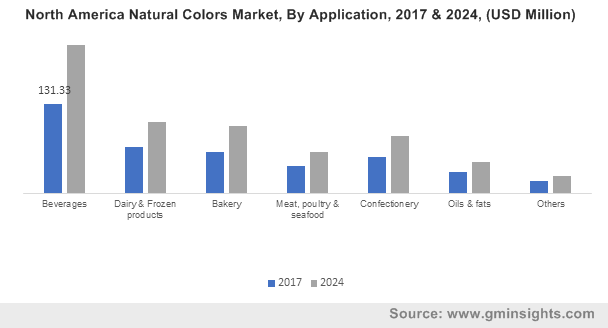 As the companies are seen boosting their production capabilities, reports claim that the natural food colorants market will emerge as lucrative investment hub, with a remuneration portfolio estimated to outpace USD 2 billion by 2024. Despite the robust demand for natural colorants, the fact that these ingredients may behave differently with different food items and may add unintended flavors, will act as major challenges for food colorants industry players to formulate colorants from 100% natural sources. To achieve optimal balance between stability, color, and flavor, several companies are investing in R&D actives to come up with better alternatives, not to mention the new range of oil-soluble coloring foodstuffs. Considering the robust growth potential of natural food colorants, it may come as a surprise that synthetic food colorants actually held for a majority of the food colorants industry share in terms of volume. Reports claim that the product accounted for a 45% share of the overall food colorants market demand in 2017. A major reason that the synthetic colorants still dominates the food colorants market, despite the growing demand for natural additives, is the cost. If estimates are to believed, artificial color dyes can be mass-produced at a fraction of the cost that is required for manufacturing & processing the materials used in making natural food colorants. Another significant reason to go synthetic is the extended shelf life of the products and the impressive hue of color offerings. The beverage industry is a prominent growth avenue for the dominance of the synthetic food colors, where they are extensively used in sodas and other beverages in the popular blue, green, and orange colors. Empowered with these highly consumer-driven industry trends, the global food colorants market is anticipated to generate massive revenue from its product types and wide application arenas. A report validating the same is of Global Market Insights, Inc., that claims global food colorants market to have surpassed 60 kilo tons in terms of volume in 2017, and anticipates the overall market valuation to hit USD 4.7 billion by 2024.